The annual CMJ Music Marathon goes down in New York this week, and we’re happy to help bring you one of this year’s best parties. We’ve teamed up with music sharing platform Cymbal and the always on point Terrible Records to bring you a massive free party at Cameo Gallery in Brooklyn this Friday. Recent Domino Records’ signings Porches., Terrible’s own Le1f (in the build-up to his new album Riot Boi), the wonderful Empress Of, and Deradoorian are just the start. Recent P&P favorites Okay Kaya and Kaya (yes, both of them!) are also playing, along with a whole host of other awesome artists. Seriously, if you’re in New York, you don not want to miss this. The show is free entry and it’s going to be a roadblock, but Cymbal are giving you the chance to make sure you get in, giving away 25 pairs of guaranteed entry tickets at the link below. The contest ends at midnight EST tonight so enter now! Get guaranteed entry tickets here. 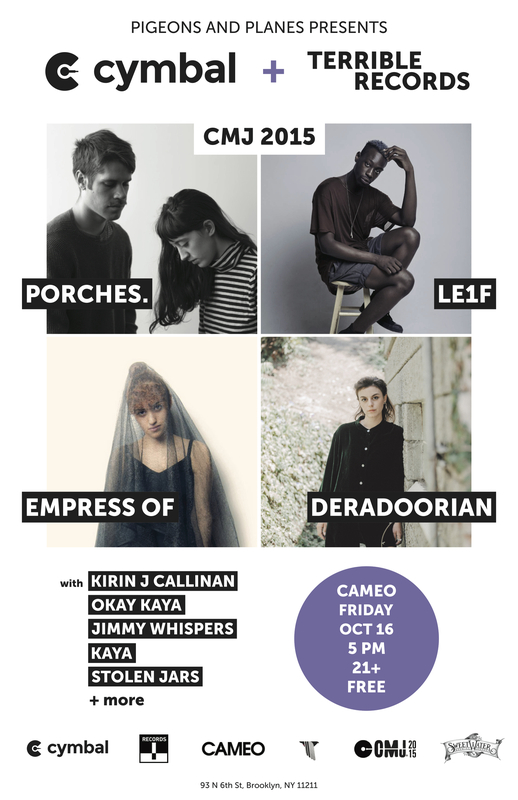 Who: Porches, Le1f, Deradoorian, Kirin J Callinan, Okay Kaya, Jimmy Whispers, Kaya, Stolen Jars and more.